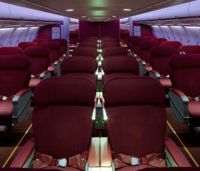 Will Hong Kong Airlines (HKA) succeed with a long haul Business Class only service from its home base to Gatwick inaugurated on 8 March 2012? The airlines and the travel industry look on, if not with baited breath but at least with a great deal of interest. Whilst HKA has the south London airport to itself, from Heathrow there is great choice, and a diversity of fares, with Air New Zealand, British Airways, Cathay Pacific and Virgin Atlantic on the route. To succeed HKA has to offer more in service and price than its competitors. As essentially a stand alone airline it cannot compete in terms of travel benefits offered by the other carriers, except at the Hong Kong end of the route where it does have very good connections to mainland China via its owner, the country’s fourth largest carrier, Hainan Airlines, and its own regional services. According to HKA UK General Manager Gerard Clarke, previously with Emirates, the airline is very satisfied with the passenger loads to date, originating traffic 50/50 from each end, with some excellent numbers booked for June. From a marketing point of view the carrier is visible in the City of London, based in Tower 42 just by the Bank of England, and Mr Clarke has an experienced team around him. He points out that the First Capital Connect service from London Bridge (home of The Shard) to Gatwick is only 28 minutes, quicker than the Gatwick Express. Hong Kong Airlines has a fleet of 21 aircraft and currently serves 26 destinations in Asia and Europe. The new Gatwick route is serviced by a pair of Airbus A330s, which will shortly be joined by a third, also available for prestigious charter operations. In fact it is a two-class carrier, Club Premier (34 seats in two cabins) and Club Classic (82 seats, also two cabins). Check-in, at the re-modelled Gatwick North, and most passengers will have some sort of hold baggage, is covered by five desks. There is never likely to be any queues and Fast Track security eliminates any hassle. 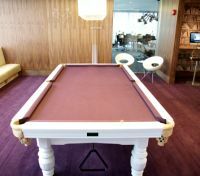 All passengers have the use of the award winning No.1 Traveller lounge at Gatwick North, where you can order a quality meal with Champagne, if the 21:30 departure followed by a meal service is too late for you. A chauffeur service is provided for passengers in Club Premier at the London end. Club Classic clients can use the Meteor "meet and greet" facility who use the excellent kerb side arrangement developed at Gatwick North, the moving walkway leading straight to the departures area. Remember what level it starts for the way back. Club Premier is configured 1+2+1 with a 6’ 1” fully flat seat. Your Editor slept solid for more than seven of the 12-hour flight. 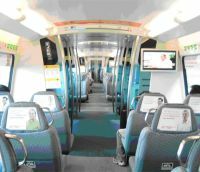 However, the seats are set in an alternative fashion, aisle and inside. This is for both the centre pair and window offering. It is a little tight if you are sitting inside. There is a turndown service with duvets, pyjamas and slippers. Amenity kits are supplied by Bvlgari. There is a forward bar for Club Premier guests and one in the rear for Club Classic. Neither has seats but the crew space can provide a resting place for those who prefer to sit down. The menus have been created by Michelin-starred Jason Atherton and Hong Kong celebrity chef Chow Chung and provide for at least five courses either European or Chinese, or indeed a mixture and include a vegetarian option. A hot breakfast is also provided. The wine selection was excellent but one has to say that in their enthusiasm, both on the outbound and return, the cabin staff could have slowed down a little. With hours to go a rushed meal is not required, but a Sandeman Ruby Port at the completion of the serving does very well as a sleep enhancer. The Thales AVIOD on-demand entertainment system gives a fine selection of films and radio with 15.4” screens in Premier and 10.4” for Classic. For Club Classic traditional cradle seats are used, not fully flat but very comfortable, but they do have the disadvantage of the inclining backrest in front protruding. Other carriers now use modular units which don’t have quite as much space but offer more privacy, Air New Zealand Premium Economy being an example. Dining is by the same cordon bleu team with slightly less choices. No ice cream either but plenty of seasonal fruit. The OnAir system is provided to give SMS and internet connectivity. Once in Hong Kong The Langham offered first class accomadation at prices much less than comparable Island hotels. There is a free bus service to the Kowloon MTR station. For the return flight it is very easy to check-in and your drop off your luggage at the railway, a 15 minute ride, and then slip quickly through immigration and security at the airport. The lounge at Chep Lap Kop is basic and provides the usual amenities and a snack meal if you want to eat before departure. 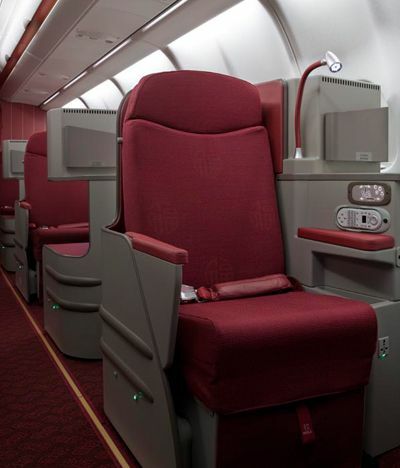 Hong Kong Airlines says that a new top grade facility is planned. The staff did have available a variety of electrical sockets to charge up a flat Blackberry. This can also be done on the aircraft. On arrival at Gatwick Premier Class passengers can make use of the excellent spa facilities at the adjoining Sofitel Hotel.